The gear Deburring Machine TM90 was designed for deburring spur and bevel gears as well as sprockets, shafts and pinions wit diameters from 30 to 350mm. 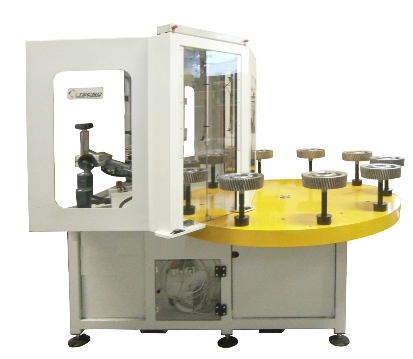 It features a rotating magazine with 10 turrets, which is integrated into the deburring machine. The machine interior is equipped with two electric high frequency deburring units, which perform the machining process both top and bottom simultaneously. The rotation sense and speed can be adjusted. This machine is the smallest one with an integrated magazine and is ideal for small- and medium-sized productions. Its easy and quick setup as well as short cycle times contribute to a user-friendly machine handling.